As you would expect, reaction to Murali’s 800th Test victims and controversial Test career has seen a number of great and good commenting on his achievements. Shane Warne said “I don’t think anyone will get there, so well done to Murali for getting his 800,” Warne told Sky Sports. “The way he’s gone about it has been amazing. There’s been a lot of controversy about his action but at the end of the day the ICC (International Cricket Council) cleared him, he’s allowed to play, and what he did with the ball was amazing. “There’s always going to be detractors to anybody. The best thing is he rose above it and just carried on doing what he does and his record now speaks for itself. “It is really amazing that someone like Murali has been able to achieve that. I think it will remain unparalleled. “I am not sure if anyone will be able to achieve 800 Test wickets in as many Test matches that I have played. He took 200 more wickets than what I ended up with. There we have it, just a few comments in the hundreds that he has surely received. A fitting end to a brilliant career. Magical Murali has done it! The accomplished spinner finally reached his target 800 wickets with the final wicket of the first Test match against India in Galle. Murali’s 800th victim was tail-ender Pragyan Ojha who was caught by Mahela Jayawardene at slip. Celebrations ensued and a magnificent and controversial Test career came to a dramatic close. When the first Test began five days ago, the off-spinner required eight wickets over two innings to further cement his place in cricketing folklore. Precariously poised on 792 wickets, a good showing in the first innings was a necessity. Sachin Tendulkar had no answer to his guile on Tuesday and was one of five victims and he went on take 5-63 as India had to follow on. Murali, now 38, began his career in 1992 and little did we know then that the mystical spinner would have surpassed Shane Warne’s 708 wickets but he would go on to reach 800 in 133 Tests. With his five wicket haul in the first, it left him with just three wickets to re write history. He removed Yuvraj Singh with the last ball of the fourth day, and trapped fellow off-spinner Harbhajan Singh lbw early on day five. Wicket after wicket fell and Murali could see his chance evaporating. Malinga was on fire and he ended the innings with a wonderful five wicket haul. With a supreme effort from Malinga at the other end time wasn’t a problem, the lack of wickets however were! With his 157th Test catch, Jayawardene moved to his left and claimed Ojha’s wicket. 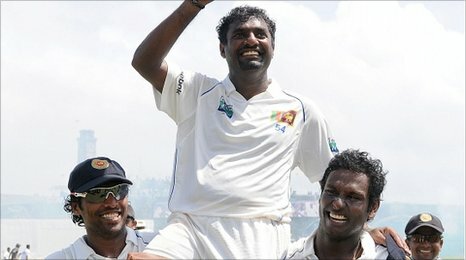 Murali and his team mates celebrated, it heralded the end of an 18 year Test career. Test Matches: 800 wickets in 133 matches. One Day Internationals: 515 wickets in 337 matches. Murali will relish attacking the tail when play resumes tomorrow with only Laxman and Dhoni left as recognised batsmen. With Murali playing in his final Test match Sangakkara will certainly ask the Sri Lankan legend to tie one end down as he looks to bag the final two wickets required to reach the magic 800 mark. Virender Sehwag sealed his 20th Test century but Murali took his 67th five-wicket haul to dismiss India for 276. Put in again, India lost Gautam Gambhir third ball and Sehwag for 31 but Rahul Dravid and Sachin Tendulkar put on 119. Dravid (44) and Tendulkar (85) fell within two overs before Murali returned to oust Yuvraj Singh in the final over. Muralitharan claimed 5-63 from 17 overs in India’s first innings and 1-57 when they followed on. India’s second innings was rocked by the loss of openers before tea. Gambhir departed in the first over for the second time in the match, caught behind off the rapid Lasith Malinga, while Sehwag was smartly taken in the gully having chased a wide one. Record Test run-scorer Tendulkar mounted a recovery, however, in partnership with Dravid as they record their 18th century stand. Tendulkar played with some freedom to chalk up his 55th Test fifty and skipped down the wicket to launch Muralitharan for a huge six over long-on. Dravid’s patience might well have deserved a fifty, but the partnership came to an end when he was caught at leg gully attempting to flick Malinga. And just 11 deliveries later, Malinga struck again, this time with the prized scalp of Tendulkar, trapped lbw by a wicked yorker just short of his 48th Test century. Yuvraj became Muralitharan’s fifth victim of the day, caught at slip, leaving India with a veritable mountain to climb. Muttiah Muralitharan has explained his decision to retire from international cricket, saying there is “nothing left to achieve”. The Sri Lankan spinner announced he would be ending his 20-year Test cricket career in just over two weeks time on Tuesday. Muralitharan said that he had been pondering retirement for a while now. His career is not entirely over, though. “There is the Indian Premier League – I will also play county cricket in England. This will surely keep me busy,” he said.